Welcome to your new home. Please review the New Tenant Handbook. All maintenance requests must go through our website. Only call our office (412-682-5886) in case of emergencies such as water, fire, smoke and any emergency that requires immediate attention. Rent payments can be paid in person at our office on 5 Bayard Road by check or credit card. You may also send personal checks in the mail or have your bank set up automatic payments. Move-in guidelines are dependent on building. For most buildings, just come to our office on 5 Bayard Road to pick up your keys. You can move in the day your lease starts but not earlier. 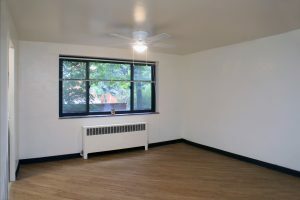 Schenley House and 147 N. Craig St. tenants must email the resident manager at schenleyhouse@gmail.com to request a move-in date. Dates will be confirmed in writing, and keys can be directly picked up from the valet booth in the parking garage at 151 N. Craig Street. Vacuum your carpet regularly, and sweep and mop hard floors including kitchen and bathroom floors. Remember to clean your kitchen appliances and refrigerator regularly. Don’t forget the bathroom! You will need to clean the toilets, sinks, and showers as well. Make sure to hang your own shower curtain to avoid water damage on the floor. Take all garbage to the appropriate trash room. Trash should not overflow in the apartment as this can attract bugs and affect your neighbors. We do inspect the apartments during the year, as written in the lease agreement. If the apartments are not maintained and cleaned, that is considered a breach of your lease agreement. We want to ensure the best living experiences for all the tenants throughout the entire building. Thank you for your cooperation. Please read the following information regarding move-outs. All keys must be returned to our office at Amberson Gardens on 5 Bayard Road. The keys must be in an envelope with your name and new address on the envelope so that we can send your security deposit by mail. If you return your keys after hours, they can be placed in the Drop Box outside of the office door on 5 Bayard Road. Keys cannot be left in your apartment or in the garage if you live at Schenley Properties. We may not receive them which could complicate the return of your security deposit. Please make sure to leave your apartment in a broom swept condition free of damages if you wish to receive your full security deposit (minus the automatic cleaning charge). You cannot leave any furniture or other items in your apartment. If you do, you will be charged a removal fee.